Setting items aside to donate to the Goodwill is a great way to reduce clutter in your home. Keeping your donations organized will help you know what your giving, particularly for tax eduction purposes. 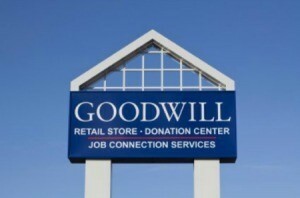 This is a guide about organizing Goodwill donations. I have started two stations in my house to reduce clutter and it's working well. I put 2 boxes in the back porch. One is for stuff we're donating to Goodwill, the other is for yard sale stuff. That way it doesn't gather all over the house, it's in one place ready to go. When I first started going through my things wanting to organize, live with less, and donate items, I thought once a year would do it. As I started, I discovered I preferred to go through small sections at a time and over a period of weeks, maybe. When I thought I was through, one day I picked out something else to give away. So for me, it works to give things away as I notice an item I can donate. One day I'll see an item in a different way than I did maybe a few months ago. What was once important, no longer is, and it feels good to let go of something; to be less attached to an object. Rather then making a pile of stuff to go to Goodwill that gets bigger and bigger on top of the dryer, I hang a heavy duty trash bag on a hook in the garage which is two steps farther than the laundry room. All donations go right into the bag. When its full, I toss it in the car (well, maybe not toss, it gets pretty heavy) and take it to the charity thrift store. It really helps to round up clutter as I have a designated place for it without thinking about where to put it or getting a box to put it in. There was an column in the week that made me think...the author was soooo right. He said when you donate to Goodwill or another charity, only donate stuff that is good. Don't use Goodwill as a place to throw away your trash. If something is too worn out, stained, damaged beyond repair, or just plain out of fashion...put it in the trash, don't give it to Goodwill for them to throw away. That costs them money. I have both given stuff to Goodwill that my kids or I have outgrown... and I am a regular shopper at thrift stores. I am disgusted when I come across stuff that no one should have to wear. Furthermore, there are a few souls who have given me clothes for my children that should have been thrown away. I end up throwing it away...because I won't give stuff like that to Goodwill. Boy, give me a topic and I run with it. At any rate, when you donate to charity, make sure that you are doing a good deed. I am very thankful when I find something really great at a thrift store. I keep a box handy for donations to charity. Taped on the box is a blank donation form to list the items on. When the box is full I donate and get another blank for my next box.